There comes a time in every airport's life when the focus has to become "out with the old and in with the new." Sometimes that means building entirely new facilities. More often, it involves breathing new life into existing facilities by adding modern updates and conveniences. Such was the case when Abraham Lincoln Capital (SPI), a commercial air service airport in Springfield, IL, recently updated its hangars. The Springfield Airport Authority and Horizon Aviation, the field's fixed-base operator (FBO), first put the wheels in motion to replace or upgrade the airport's hangars in September 2013. The airport's three hangars supporting operations at Horizon were approximately 55 years old and lacked modern features. After evaluating multiple options, airport officials decided against demolishing a facility known as Hangar 3 and building new. The most efficient plan was to preserve some portions for reuse and reconstruct the rest. Roger Blickensderfer, director of Facilities and Maintenance at SPI, calls the strategy "sustainable reutilization." Hangar Size: 20,000 sq. ft.
"Rehabilitating it would give us an operational facility that would allow us to do more construction at the airport as time went on," explains Blickensderfer. Executive Director Mark Hanna notes that rehabbing Hangar 3 was the first phase of a larger plan to overhaul the entire FBO facility. 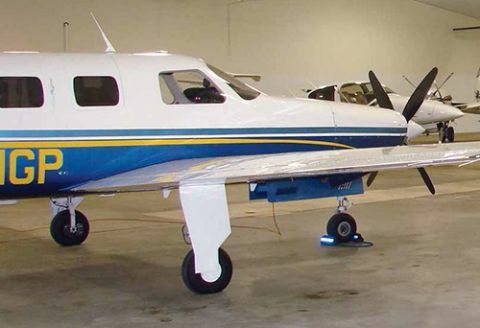 Some of SPI's corporate users sought their own space on the field, but were not interested or able to lease property or having the airport build them a hangar of their own, he explains. "These corporate tenants were at a point where they were starting to fly more for business, but weren't quite at a point where they needed their own facility," Hanna elaborates. Rebuilding 'Hangar 3', and changing its configuration, enabled the airport to fashion a more efficient hangar with suites, or smaller, individual corporate hangars under the same roof. Airport management considers the project a short-term measure that facilitates long-term plans to update all the buildings at the FBO complex, including the airport's other two hangars. "We wanted to provide the best infrastructure possible to support the airline, corporate and general aviation owners and operators, and the flying public who use Abraham Lincoln Capital Airport," says Springfield Airport Authority Chair Frank J. Vala. "Restoring Hangar 3 to like-new condition produced immediate benefits for corporate, general aviation tenants and Horizon Aviation FBO." Before any changes occurred, officials debated the merits of keeping the more than 50-year-old hangar. "We batted back and forth between rehabilitating the hangar and building new," Blickensderfer recalls. "But brand-new construction would have had to go back on the same footprint, or very close to the same footprint, which would have meant removing the concrete floor as well as the entire structure." The airport retained Knight Engineers & Architects to develop options for Hangar 3. After a professional review of the facility's interior and exterior, Knight determined that the structure's bones and steel facade were reusable and able to support new siding and roofing materials. The $1.3 million price tag for reconstruction was also low enough that the airport could release the facility back to Horizon Aviation and amortize the payments, Blickensderfer says. Demolishing the hangar in its entirety, then building a new one was estimated to cost approximately $5.5 million, notes Hanna. "The economics made sense: $1.3 million vs. $5 million," he relates. "And the expected lifespan of either option was about the same." Jon S. Ditter, senior architect at Knight Engineers & Architects, notes that his firm supported the decision to rehab rather than replace the hangar, and his team relished the chance to use sustainable and green building concepts to execute the project. "The rehabilitation essentially doubled the building's lifespan, while providing like-new building aesthetics," says Ditter. "[It also] increased efficiencies and performance, which will serve the airport and its tenants for years to come, while reducing its impact on the environment." Before recent renovations, Hangar 3 was an underutilized open bay hangar with one 80-by 18-foot bi-fold door and aged electrical, lighting and heating systems. Smaller, single-engine aircraft were its primary users. The plan developed by Knight and SPI converted the 20,000-square-foot hangar into a three-suite facility, with approximately 12,600 feet of common hangar space and two corporate suites. The individual suites, each with its own doors, contain about 4,000 square feet and 3,400 square feet of space, respectively. "The hangar was deeper than it was wide," says Hanna. Although the design was inefficient for ground handling, aircraft storage and moving aircraft in and out, the large, long footprint enabled designers to break up the space into three separate parts. With two doors of slightly different sizes on the north side, the new hangar can accommodate larger aircraft with wider wingspans, while also offering separate suites for smaller aircraft. Occupants now refer to the hangar as user-friendly, notes Blickensderfer. To preserve the hangar's main steel structure, which engineers determined was sound, crews began by installing additional beams and cleaning the steel. Next, they applied a conversion coating to the entire structure to prevent rust and corrosion. According to Hanna, the conversion coating will extend the life of the building by up to 50 years. It also eliminated the need to mill new steel and haul it in from another location, he adds. "The entire structure was cleaned and power-washed, and then this conversion coating was put on to keep corrosion and rust from returning." Crews also replaced all remaining metal materials and the facility's electrical and mechanical systems. "All of the roof's steel; all of the sidewall steel; and all electrical, mechanical materials were recycled," reports Blickensderfer. "The airport took bids from local recyclers to get the best price per pound. These materials will be reused in other metal products down the road. Plus, there was a little bit of value returned back to us in recycling these materials." Retaining the hangar's existing structure allowed the airport to keep the original concrete floor intact-a measure that reduced construction dust and haul-away emissions, minimized materials going into landfills, and prevented potential damage to existing roadways. Changes to the ceiling reduced the area inside the hangar that requires heating by 23%. The original hangar had a high interior roofline and lacked a traditional ceiling, explains Blickensderfer. "It was about 44 feet from the roofline to the peak," he details. "We put in a 20-foot ceiling and insulated [it]." The new ceiling also prevents birds from sitting on the original building structure inside the hangar. Previously, birds created a mess that required additional maintenance and posed potential health hazards. Between heat and electricity, the new hangar consumes 28% less energy than its predecessor, reports Blickensderfer. "We had been heating a much larger area than we needed to," he explains. "Heat rises, and we were heating up by the peak of the roof. That wasn't helping keep heat where it needed to be, which was where the airplanes were actually parked." White paint on the ceiling reflects light from the hangar's new induction lighting system, which improves visibility in the suites while reducing the amount of electricity consumed. Engineers also right-sized the infrared heating system to the facility's square footage. Infrared heaters, combined with the lower ceiling and improved insulation, reduce the total thermal units needed to heat the suites and improves the quality of the heat produced. "Before the rehabilitation, the heating costs were very significant," Hanna recalls, noting that new efficiencies benefit tenants and the airport alike. Inspired by the performance of interior induction lighting (Blickensderfer estimates that it is 60% more efficient than the previous system), the airport decided to install LED lights outside. The new energy-efficient fixtures are expected to further reduce tenants' electric bills, greatly improve the security and safety of night operations, and reduce maintenance needs. "We'd already been moving toward LED lights throughout our airport facilities," comments Blickensderfer. "We've had extremely good results with electricity reductions using LED lighting." Despite the project's numerous sustainable features, the airport opted not to pursue Leadership in Energy and Environmental Design (LEED) certification from the U.S. Green Building Council. "We wanted to incorporate sustainable concepts into this rehabilitation to gain the benefits and efficiencies associated with such construction techniques," explains Hanna. "Doing so will lower operating costs for our tenants and reduce maintenance costs for the airport authority." LEED certification simply wasn't necessary, he adds: "We wanted to add sustainable processes and preserve infrastructure, and build using LEED concepts. But we thought instead of spending the money to go through the LEED certification/commissioning process, those funds could be used to create greater value in the project." With or without LEED certification, the airport has an energy-efficient facility that is, for all practical purposes, new, he reflects. It's also being well received by users, adds Blickensderfer. "The reconstruction and rehabilitation of Hangar 3 was immediately appreciated," he comments. "The two corporate suites were rented and occupied on the first day of availability, and the aircraft operators in the common hangar refer to it as new hangar space." Previously, owners were reluctant to store their aircraft in the hangar. "That is no longer an issue," he says proudly. "We see aircraft being moved in there that weren't part of this FBO's customer portfolio previously...This is a brand-new hangar in every aspect from a day-to-day use standpoint."